In my last blog, I did discuss the Organization Dimension of the Target Operating Modell. Today, I want to reflect on the impact of organizational capabilities on the IT staff. One of the most important “capability” of any organization are the competencies of the people working together. “Competence” in this repect is being seen as a combination of „knowledge“, „skills“ and „behavior“. 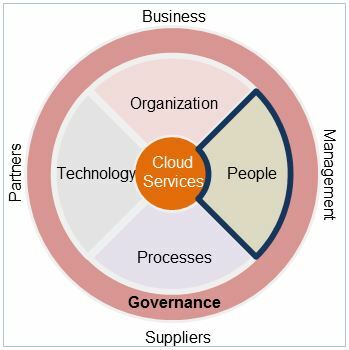 Recalling the previously discussed “capability” focus areas for Cloud Computing (Governance-, Risk-, Relationship-, Service and Process Management), what would be the impact the required individual competencies of IT staff? Talking about the behavioral side of the competencies: Developing attitudes and social aptitudes supporting the shift from a more traditional, operational focused technology provider to a “value-add” internal service provider is the harder part. Very rarely, internal IT organizations where able to develop this in the past. Here we are talking about customer focus, quality ethos, assertiveness in talking to external and internal stakeholders, adherence to guidelines, policies and the application of respective consequences in case of circumventions. As we all know, this cannot be trained. Managers need to think about how to enrich their organizations with these behaviors – at least with promoted champions and change agents. One option is to look for experienced staff from external sourcing providers. Usually, they are coming with such desired behaviors and they are able to raise the bar for the others.